GENESIS OF THE RULE OF THE TEN VIRTUES OF THE MOST B.V.M. The Rule of the Ten Virtues of the Most B.V.M., or the Rule of the Ten Pleasures of the Most B.V.M. (Regula Decem Beneplacitorum Beatissimae Virginis Mariae), is one of the few religious rules approved in spite of the decree issued by the IV Lateran Council in 1215. This decree forbade the approval of the newly founded religious orders on any other than one of the previously approved rules. The Rule was composed by a Franciscan, Fr. Gilbert Nicolas, better known as Gabriel Maria, the name he received from Pope Leo X by his brief (breve) of June 11, 1517. By this act, the Pope wished to emphasize the special devotion that Fr. Gilbert had for the mystery of the Annunciation of the B.V.M. Gilbert Nicolas, who also appears in history under the name of Johanes Molezius, was born around 1460 in Riom in the Province of Auvergne, France. Influenced as a 16-year old youth by a sermon by a certain Franciscan preacher on the topic of the Immaculate Conception of the B.V.M., he discerned his vocation to the religious life. 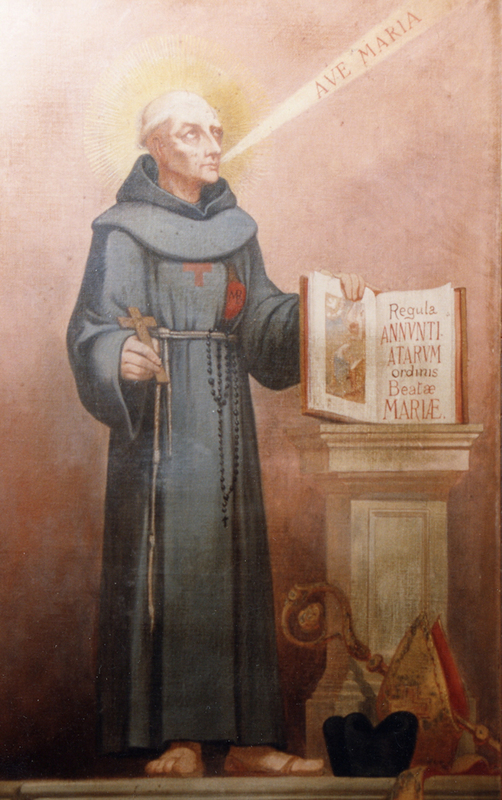 In 1475, in Lafond, near La Rochelle, he joined the Franciscans of the Strict Observance. After completing his novitiate and pronouncing his religious vows, he was sent to the monastery in Amboise in order to continue his education that concluded at his priestly ordination and taking the post of a lector of theology. 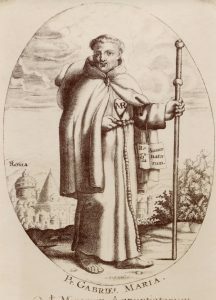 Father Gilbert fulfilled various functions in the Franciscan Order: he was the guardian of the Amboise monastery (1498-1502), the superior of the Province in Aquitaine, and thrice the general commissary of the Order. According to his biographers, Fr. Gilbert was distinguished for his great knowledge, however, out of humility, he never wanted to accept the Doctoral degree and rejected frequent proposals of being nominated a bishop. Within his Order he was known for his great holiness of life and fostering Franciscan poverty in a special way in the Order’s legislation and life. He was also noted for his particular devotion to the Eucharist and the Passion of the Lord. 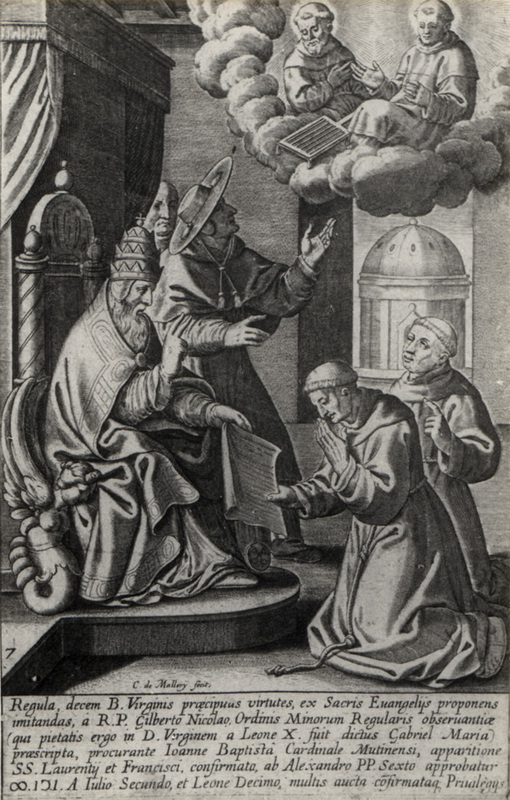 Both the Franciscan and Annunciade traditions gave him the title of the Blessed. He died on August 27, 1532, at the convent of the Annunciade Sisters in Rodez (no longer existing) and he is buried there. From 1498, Bl. Gabriel Maria was the confessor and spiritual director of Joan de Valois, Queen of France and then the Duchess of Berry. Joan was born on April 23, 1464, at the castle Nogent-le-Roi, as the second daughter of King of France Louis XI and Queen Charlotte de Savoy. The newborn princess was badly received by her father who wished for a son. At the age of two months, according to the custom of the day, she was betrothed to her father’s cousin Louis, the two-year old Duke of Orléan. She married him in 1476, at the castle of Montrichard, thus receiving the title of the Duchess of Orléan. In April of 1498, after the death of Charles VIII, Joan’s brother, her husband succeeded to the French throne as Louis XII and Joan became the Queen. Shortly afterwards, because of political reasons, her husband asked the Apostolic See for an annulment of their marriage, which was granted. After the annulment of marriage and the loss of queenship in 1498, Joan’s former husband granted her the title of the Duchess of Berry. She never held any grudge against him, but instead she prayed for him until the end of her life. Free from her spousal duties, she gave herself to prayer and works of mercy. In her childhood Joan had a vision, in which the Blessed Mother allegedly announced to her that she would found a religious community in her honor. With the help from her spiritual director, Blessed Gabriel Maria, the Duchess of Berry and 11 other women started a contemplative order of the Virgin Mary. It was also known as the Order of the Ten Virtues or Ten Pleasures of the Mother of God, the Order of Annunciation of the B.V.M. or the Annunciade. The Blessed Virgin Mary was to be the model for the nuns and the virtues that she practiced, that are mentioned in the Gospels, became their rule of life. Thus The Rule of the Ten Virtues came into being, because the Scriptures directly speak of those virtues. Each of the ten chapters of the Rule refers to a concrete virtue of the Blessed Mother noted by the Gospels. Under Joan’s direction Fr. Gabirel Maria prepared in 1501 the text of the Rule. Along with professing poverty, chastity, and obedience, the Annunciades also vowed to remain cloistered. An old drawing depicts Fr. Gabriel Maria, OFM on his way to Rome to seek the approval of his Rule. The approval of the Rule was granted when many adversities have been overcome. First, the Holy See was petitioned through the mediation of Fr. Wilhelm Morin, OFM, for approval of the newly created religious institute. Pope Alexander VI received the emissary very kindly and spoke of the piety and devotion of the daughter of Louis XI. However, the cardinals, assembled by the Holy Father for this occasion, at once brought forth the proscription of the IV Lateran Council concerning the installation of new orders and unanimously denied the approval of the submitted Rule. Some time later, Fr. Gabriel Maria personally traveled to Rome, but this time again the cardinals in attendance spoke against its approval. As tradition would have it, an intervention from heaven eventually prevailed over their decision in this matter. That very same night, the chancellor of the Apostolic Dataria (one of the main pontifical offices, no longer in existence), Cardinal J. B. Ferraro, Bishop of Modena, who had great influence within the College of Cardinals, allegedly had a dream, in which the Lord God reproached him for refusing to approve the new Order. In this dream the cardinal saw St. Lawrence the Deacon and St. Francis of Assisi extending their arms over Gabriel Maria in a gesture of blessing. Their countenance seemed to say to the cardinal that this humble religious was an instrument of God. Then, still in his dream, the cardinal saw with new eyes the grandeur of Mary in her mystery of the Annunciation, which made him feel obliged to found a new Order dedicated to the honor of this mystery. He awoke with a very strong impression from this dream, reproving himself for resisting the Divine cause. After a prayer and a fresh consideration of the matter, he called Fr. Gabriel to himself and recounted his nighttime experience. He then went to the Pope, requesting his approval for the new Order. And indeed, he equally convinced Alexander VI and the cardinals. On February 12, 1502, Pope Alexander VI ratified the new Rule and the new order. After giving the approval, the Pope nominated Fr. Gabriel Maria the General Visitator of the new community. On the Feast of Pentecost in 1504, Mother Joan made her profession upon the Rule of her Order. First novices of the Order of the Blessed Virgin Mary made their vows on November 9th of the same year. 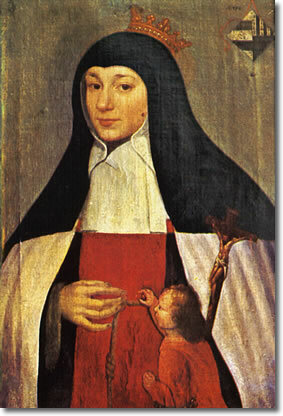 The Order of the Annunciade was ratified shortly before the death of its Foundress, which occurred on February 4, 1505. Death interrupted her efforts of founding a male branch of her Order. Although she made her religious vows, the Duchess of Berry resided in her castle at Bourges until her death. She was buried in a religious habit and a ducal crown on her head. Even though Joan was accorded a cult of reverence right after her death and was considered a saint, yet it was only in 1742 that Pope Benedict XIV celebrated her formal beatification, and she was proclaimed a saint by Pope Pius XII in 1950. Joan’s earthly remains were desecrated and burned by Protestants on May 22, 1562. Old drawing shows the moment of approval of the „Rule of Ten Virtues” by Pope Alexander VI in 1502. On May 23, 1515, already after the death of Joan de Valois, Pope Leo X gave his approval to the second edition of the Rule. Just like its first edition, this Rule was also written by Fr. 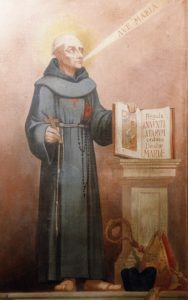 Gilbert Nicolas who did so with the goal of uniting the Order of the Annunciade with the Conceptionist Sisters – a contemplative community founded in Spain, in 1484, by St. Beatriz da Silva e Menezes (1424-1490). However, the Conceptionists did not agree to the union, in view of that Fr. Gilbert prepared a third edition of the Rule which was approved on July 25, 1517 by Pope Leo X. In 1528 and 1529, the Friars Minor of the Observance added supplements and statutes to The Rule of the Ten Virtues of the Most B.V.M. Pope Julius II, and also popes Innocent XII and Innocent XIII, confirmed The Rule of the Ten Virtues of the Most B.V.M. Along with giving a certification to the Rule, Julius II, and the above-said Leo X, granted indulgences to the Chaplet of the Ten Evangelical Virtues of the Blessed Virgin Mary, contained in that Rule. The Chaplet which was composed by St. Joan is an obligatory spiritual exercise for those who retain the Rule. In following of the instruction from the Apostolic See, The Rule of the Ten Virtues of the Most B.V.M. was adopted for a male order, which was in agreement with the wish of the Foundress, as mentioned before. Throughout the centuries, the popes granted numerous spiritual graces, privileges, and indulgences to the Order of the Annunciade. M. Nowodworski, Encyklopedia Kościelna, t. VI, Warszawa 1875, p. 5. M. Cagnac, La bienheureuse Jeanne de Valois, J. de Gigord, Paris, 1929, pp. 116–121. J.R. Hale, Renaissance Europe; Individual and Society, 1480-1520, New York: Harper & Row, 1972, pp. 15-16. K. Krzyżanowski MIC, Powstanie i rozwój Zakonu za życia Założyciela, in: Marianie, Ed. J. Bukowicz, MIC, T. Górski MIC, Rzym 1975, pp. 18-31. A. Pakuła MIC, La «Règle des dix plaisirs de la Bienheureuse Vierge Marie» dans l’histoire de la Congrégation des Pères Mariens, in: Jeanne de France et l’Annonciade, Ed. D. Dinet, P. Moracchini, Sœur M.-E. Portebos OVM, Paris, 2004, pp. 401-410. Z. Proczek MIC, Stróż duchowego dziedzictwa marianów; wybór pism o. Kazimierza Wyszyńskiego, Warszawa – Stockbridge, 2004.